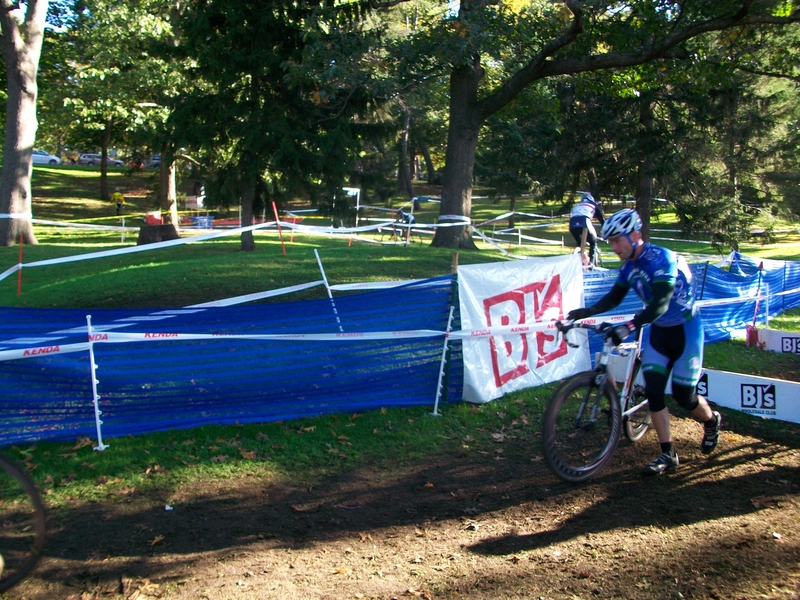 So this was the year that I would finally try my hand at Cyclocross or “Psychocross” as I’d heard friends refer to it as. I passed the idea by a couple members of the Dedham Bike racing squad and was met with an excitement filled “let’s do it” ! Now mind you, none of us had ever tried this side of bike racing. Some of us have extensive road or mountain bike experience but most of us had never so much as thrown a leg over the top tube of a cross bike. We all had different ideas on what was to come but one thing we all knew was it was going to be different and it was going to be fun ! Some of us spent some dough and grabbed cross bikes while others ran with what they already had. The idea was to do it as cheap as possible while still having decent enough stuff so as to not let our equipment hold us back. Yeah well the cheap route didn’t last too long and before ya knew it we were all getting new bikes and wheelsets, I guess you could say we are all a bit competitive ! After we got all our gear issues settled we decided to hit up our 1st race out at Springfield’s Blunt Park. Matty Bruce & I woke up to a mid 40 degrees and rainy Sunday. Let me tell those of you that haven’t done an athletic event at 8 a.m. in the morning on a cold rainy day it will definitely make you question what your idea of fun really is ! But we also knew going into the whole cross thing that weather can and will play a part in this type of racing, it really can be a big contributor to the outcome of any type of racing but especially to Cyclocross races. So there we were at 6 a.m. hauling down the Mass Pike in the rain wondering if we had made a mistake in thinking that we going to have fun in our new endeavor, when we both agreed that whatever the outcome we would have fun and that it was definitely better than being at work ! We arrived at Springfield at about 7 a.m. and had time to walk the course. What we saw was a super fun looking race course with all types of challenges including singletrack, a bunch of mud, barriers , slick roots and logs. We were both a bit nervous at 1st ride on the course being on new bikes with very little riding time on them but we were confident that our years of riding experience would take over and see us through just fine, because after all a “bike is a bike” in my mind. So finally it’s time for our race , we both had signed up as Category 4 ‘s seeing as how this was our first crack at this stuff. What we didn’t know was that there were no “call ups” for staging at the start based on registration order. So as a result Matty and me ended up lining up darn near last, oh well we can make up ground easily enough right ? Haha, not so easy after all we quickly found out once the race started. The start was about 150 yards of paved road into a hairpin turn on grass, this was like pushing 50 golfballs down the same garden hose ; you do the math. Well as it turned out we both ended up doing better than expected , out of a field of nearly 50 guys we got 12th and 19th respectively. We were both pretty jazzed by our results but we also knew we both could do better and we would. One thing was for sure after this 1st race, we both agreed that it had been years since we had so much fun on a bike. Cyclocross is one of the hardest things you will do on a bike and at the same time one of the most fun and rewarding things as well. 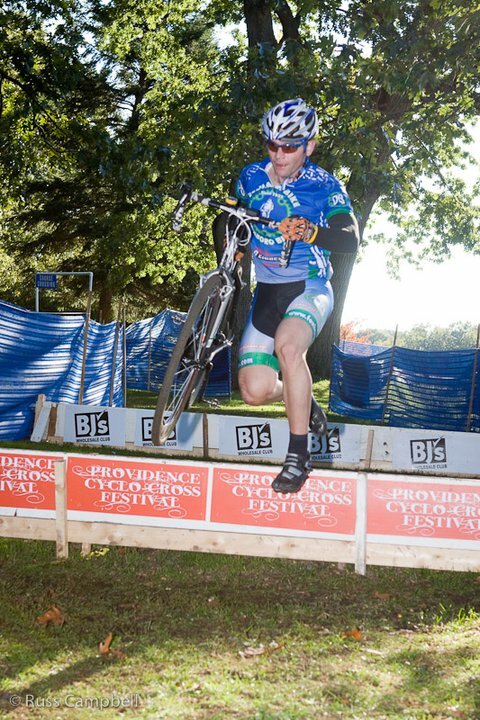 Cyclocross was here to stay for the Dedham Bike crew ! 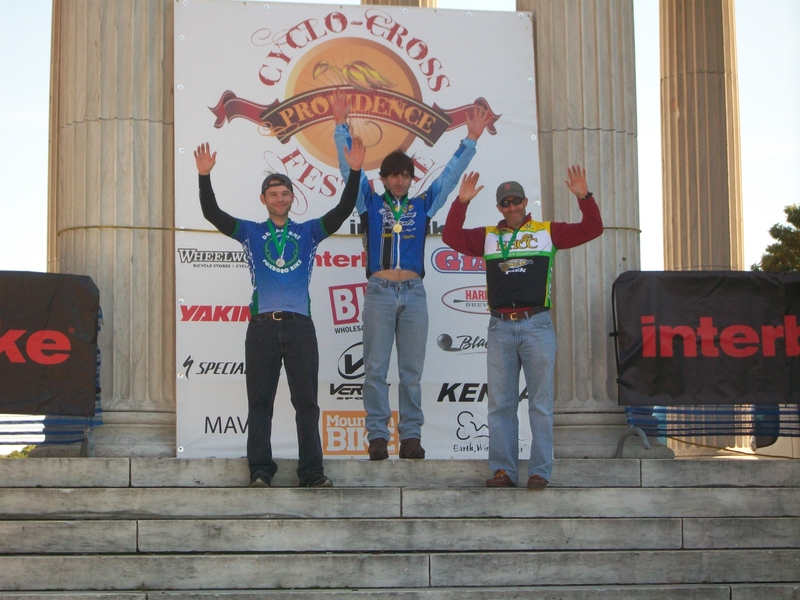 Matty Donovan getting his Silver Medal(far left) after Sunday’s Cat 4 35+ race in Providence . He preceded that with a 5th on Saturday. A pretty good weekend of racing all in all ! If At 1st You Don’t Win…Tri….Tri Again!